I am hosting the July challenge at One Layer Simplicity. In honour of Canada Day (July 1st) and American Independence Day (July 4th) I decided to make the challenge about flags. 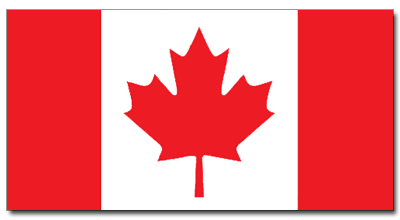 I want you to take a look at your country’s flag and find some inspiration there. It could be the colours, the layout, the patterns or the images. I created two cards because I have lived my life in two countries. I was born and raised in Australia and lived there for the first 35 years of my life. I married my Australian husband and both my daughters were born there. When they were 4 & 6 our family moved to Canada and seven weeks after we arrived my son was born. We have lived here ever since which will be 14 years next month. 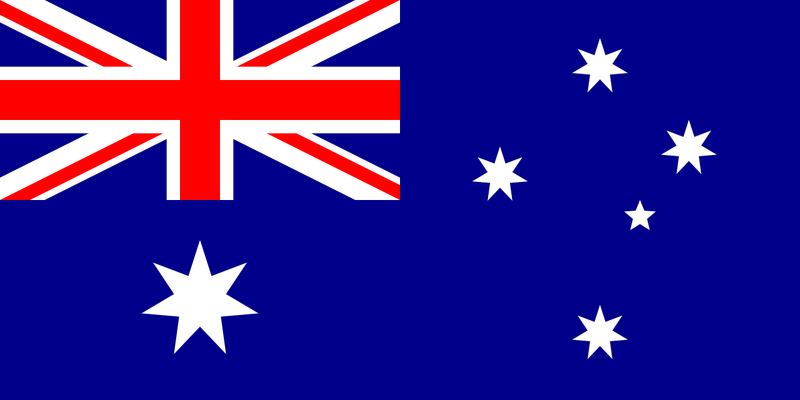 The card above is inspired by the Southern Cross on the Australian flag. I miss seeing the Southern Cross when I look up into the sky at night. I cut a card base from watercolour paper as I planned to make it quite wet with distress stains and water. To frame the stars I tore the edge off some masking tape and taped the card base to a cutting mat. 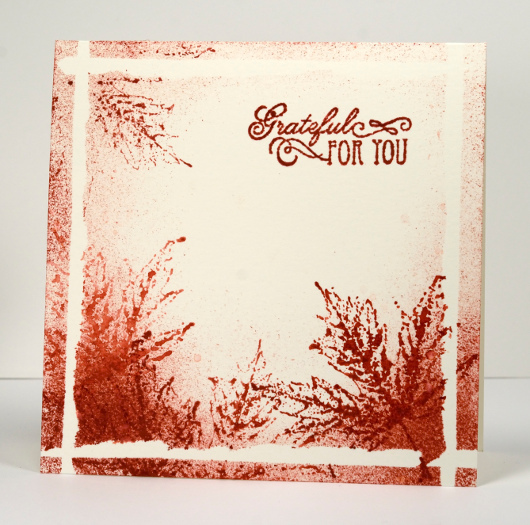 Once taped I stamped stars of different sizes and the sentiment in versamark then embossed with clear powder. I swiped three blue distress stains across the watercolour paper filling the whole space with colour. To blend it I spritzed a generous amount of water mixed with pearl-ex powder. You can see the sparkle of the pearl-ex powder below. 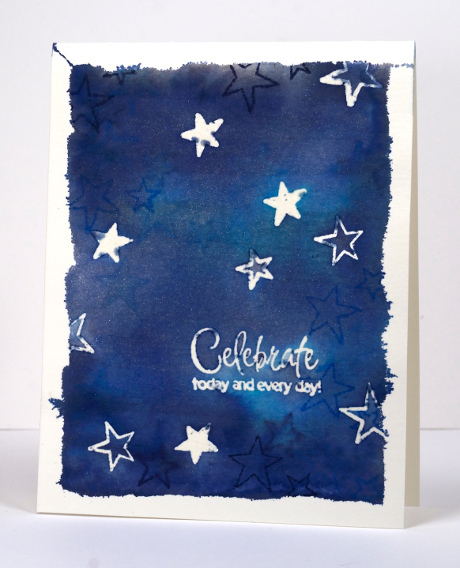 After the panel had dried a little I stamped some more stars, this time in blue inks. When dry I removed the tape and ironed the panel embossed side down onto computer paper to melt and remove the embossing. After years of avoiding yellow and orange tones in clothes and fabrics I am really enjoying using their bright warmth in stamping these days. 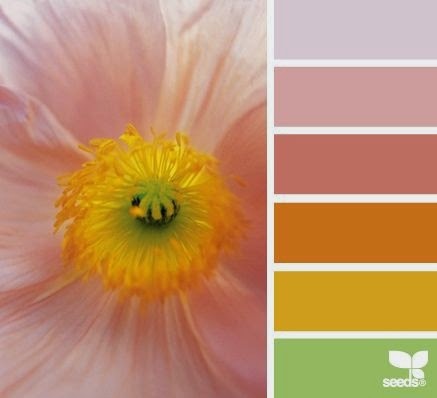 I especially like the combination of yellow, orange and navy. I know leaves are rarely navy but orange and navy are opposite on the colour wheel so they create a contrasting stable colour scheme. I chose three colours to participate in this week’s Less is More challenge and the layout is inspired by the CAS(E) this sketch for the week. I just realized I can link up with our current One Layer Simplicity Challenge also to use flowers on a one layer card. I cut a curved mask to cover the lower two thirds of the card base then chose three stamps from the transparent set Petal Power. 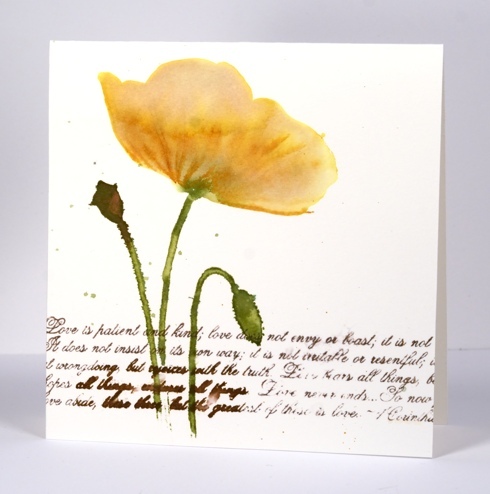 I inked the solid petal stamp with mustard seed distress stain and added spiced marmalade along the petal edges. I then inked the co-ordinating outline stamp with just spiced marmalade on the top edge and stamped over the blooms. I stamped a few leaves in chipped sapphire distress stain and added the sentiment in Memento Paris Dusk. 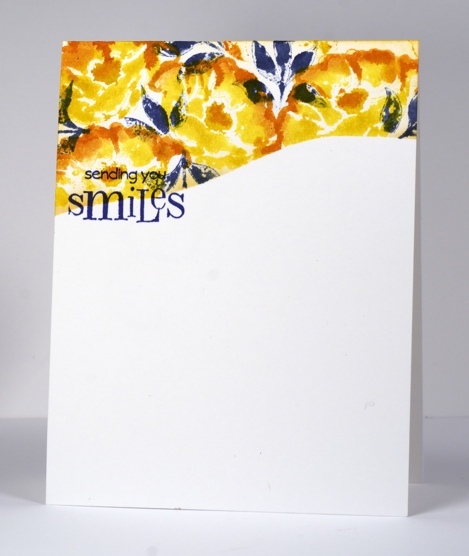 The new One Layer Simplicity Challenge is to make a card with flowers on it. There is already a gorgeous array of floral inspiration on the blog and you have until May 24th to add yours. The current Mod Squad challenge is to make a one-layer card so my poppy card meets the criteria there also. To create this watery poppy I positioned the ‘Sun Catcher Stencil’ then painted the flower head in water. While it was very wet I added both Mustard Seed and Victorian Velvet Distress stains to the water and blended them with a paintbrush. 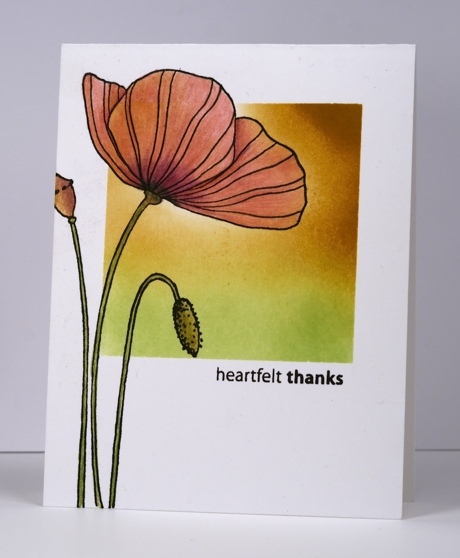 I used the co-ordinating ‘Poppy Time’ stamp to stamp the stems, bud and seed head then used a paintbrush to immediately fill them with distress stains. By this stage the poppy head had dried a bit so I inked some of the stamp with ink to add a few veins to define the petals. I added the verses from 1 Corinthians in a mix of Memento ink and distress stain allowing some to blur and some to bleed. The piece of watercolour paper already had two ink drops on it so I carefully added a few more rather than going overboard with the flicking technique I have been using lately. Thanks for dropping by. I hope you enjoy the rest of your weekend. 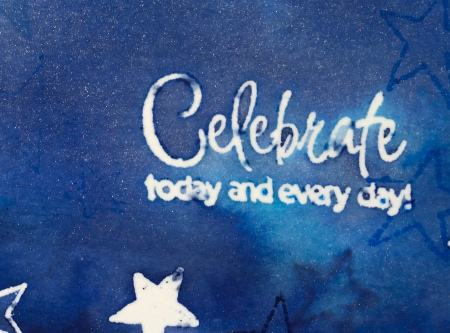 Edited to add: If you are interested in an “Introduction to Stamping” class there are a few spaces left in the class I am teaching at “Crop-A-While” in Orleans on Thursday May 8th. Please click on the store link for more details and contact the store to register. The challenge hosted by Ardyth at One Layer Simplicity this month is ‘Road Trip’ and can be about the travel method or the destination. 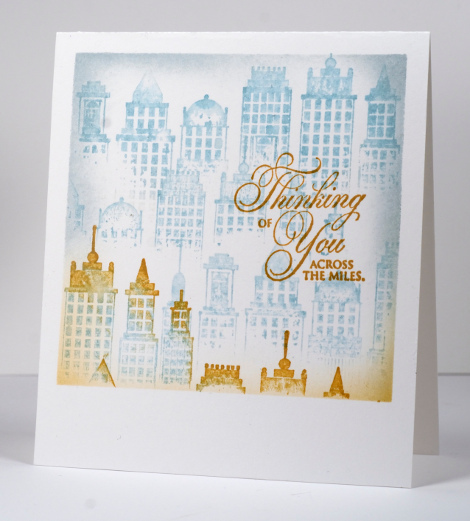 I decided to feature a city far away on a Thinking of You card. Most of my family live in cities on the other side of the world, sadly not cities I can take a road trip to. I have created city-scapes with this stamp before using more of a watercolour effect. I simplified the process for this one layer version. I masked a square with painter’s tape and inked the top of the stamp with tumbled glass distress stain. I stamped once, reinked the top of the stamp again and stamped below the first impression. I stamped a third time with blue then added a little memento potter’s clay ink for the last two impressions. I sponged the perimeter in blue and potter’s clay before removing the masks and adding a sentiment. The challenge is open until April 24th so it is not too late to add your travel inspired card. My card also fits in nicely with the current Addicted to CAS challenge “Far Away“. OLS #2 Can you repeat that? There is a new challenge up on One-Layer Simplicity. 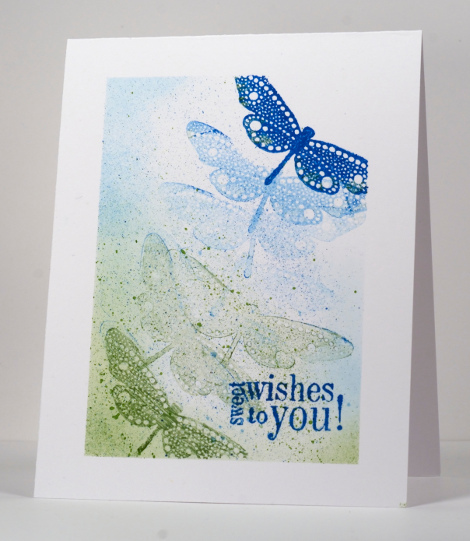 Pop on over and start dreaming up a new one layer design for this month. I am hosting challenge #2 and I want you to repeat yourself. You don’t need much for this challenge; you could use with one little stamp or maybe two like I did, just as long as you repeat one of them. There are more details over on OLS. I masked my edges then stamped the dragonfly several times in blue, a few more times in green then splattered blue and green specks all over. Before removing the masks I sponged the edges to frame the scene a little more.